Are you looking for a great shed in Scotland? Explore our massive range of sheds, all from the comfort of your sofa, and discover the perfect shed for you. With high quality sheds to suit all budgets and with a choice of metal, wooden and plastic sheds, Shedstore is sure to offer your ideal shed. Why not look at our special offers available now? 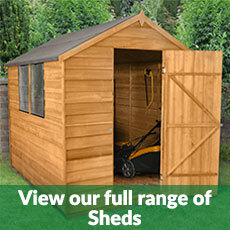 We regularly check our competitors' prices so we can offer you the best shed at the best price. Our friendly Shedstore call centre team can help you choose the right shed for you and have it delivered to Scotland and your garden, call us on 0333 003 0518 or email [email protected] to discuss.